Math teachers, you know that students need spiral review and much of the time, review of material taught in previous grades! That’s why we created the Comparing Fractions Scavenger Hunt for you. At the time of this post we have grades 3-5 published, and grades 5-6 and 7-8 are coming soon! Place the cards in order around the room. Use a card number as a starting point for each student. The student will work the problem on their assigned card and record the answer. A student answer page has a box that matches their card number. Once they have the answer, they will move around the room looking at the bottom of each card until they find their answer. The student will then work the problem on the new card. Each student will continue in this rotation until they have answered all 16 problems. Remind students that the answer at the bottom of the card does not go with that card. Fun and interactive! Engaging for students…and rigorous. -Nancy F.
Tap here to learn more. 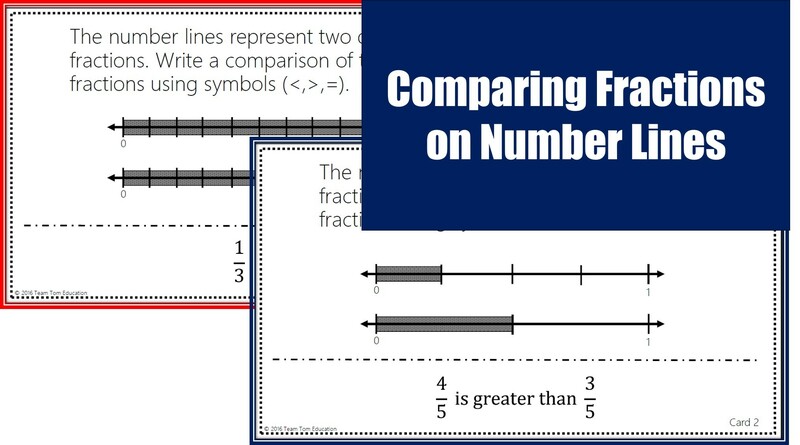 If you have a friend or colleague that would love to know about this comparing fractions math games, please consider sharing on Pinterest or Facebook! Why is this Math Game Important for Learning? Math games increase engagement and interest in learning (read here for more on Games and Student Interest). The scavenger hunt allows for physical activity, which primes the brain for optimum learning states. Fun increases those happy hormones (i.e. endorphins) that lead to better retention and recall. A game is a different format than original instruction. The helps students to see the content from a different point of view. Fractions are difficult but very important. A fractions scavenger hunt will provide students with spiral review. A math game can provide a low-risk environment where students feel safe to attempt the fractions problems. This is critical for deepening understandings. How is the Comparing Fractions Scavenger Hunt Unique? This scavenger hunt has no distracting borders, graphics, and fancy fonts. The math is front and center. Students can focus on problems that are deeply aligned to standards and not “watered down”. The rigor is challenging, but the format is supportive for student success. 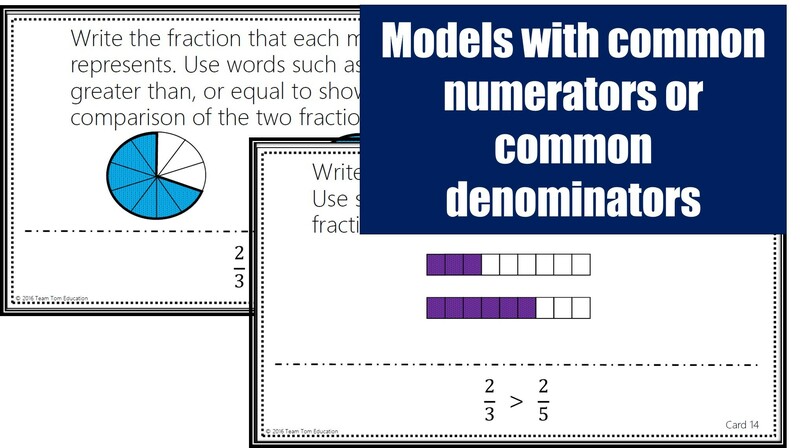 The fractions have common denominators and common numerators. 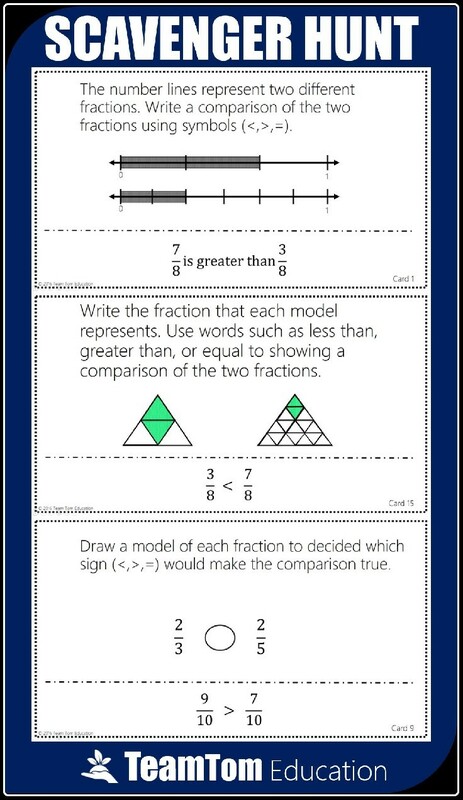 The fraction models are in a variety of formats including number lines, numerical expressions, pictures, and graphics. Most importantly, students love the interactive and engaging format! Tap to shop now for these math games and other task card math activities.